How do these top end watches compare? 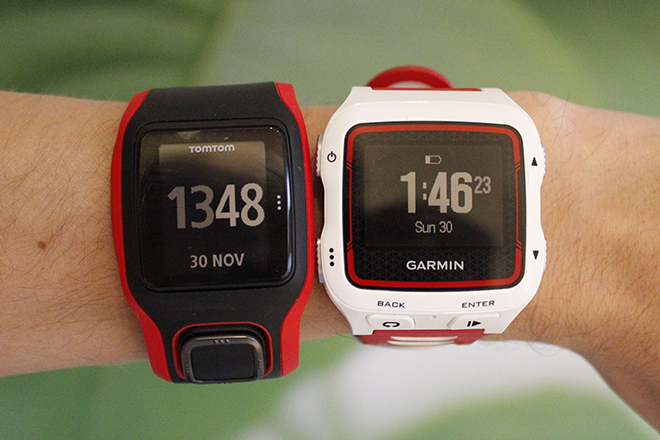 In our series of comparisons for the Garmin 920XT we’ve already seen the Polar V800 and the Suunto Ambit3 and now it’s time for the TomTom MultiSport Cardio. For more in depth information about the Forerunner read our 920XT preview. The TomTom is designed for sports and compared to the Garmin’s extensive features it’s in a different field, but it has it’s strong points. Both have a normal watch functionality and can last quite some time on a battery functioning as such. However with support ‘smart watch’ features (for phone notifications etc.) the Garmin 920XT is much more than just an exercise tool. Besides this, the Garmin 920XT supports a color screen and with the Garmin IQ functionality, we’ll have to see what other neat features become available. 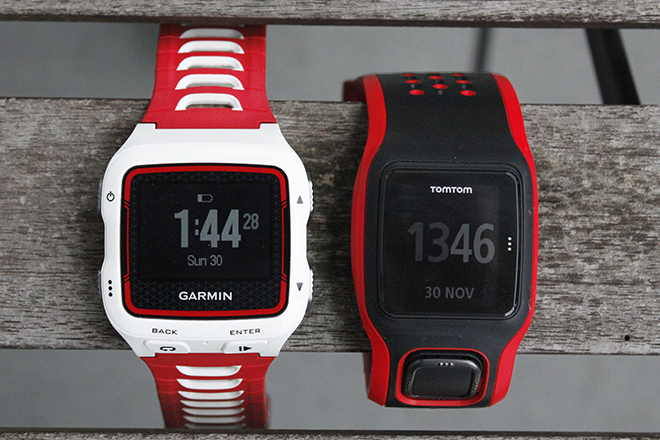 The TomTom Multsport and Garmin 920XT watches side by side. 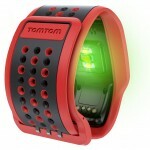 TomTom measures heart rate on your wrist. As expected, both watches have full support for cadence, speed and heart rate. And the TomTom Cardio has a built in heart rate monitor, which is pretty accurate (we haven’t seen any complete goof ups). But because it measures on the wrist the watch is unable to measure your HR-V. A variable used to see how much effort your workout actually did cost you. Garmin uses this to give you your recovery time and workout intensity. However, if you are not a competitive age grouper you wouldn’t use this anyway. On the GPS side, they are both quite fast with catching the signals, unlike the 910XT where it sometimes takes a couple of minutes, they were both pretty quick in getting ready. Both watches have support for swimming. You can set pool lengths and measure your efficiency. Although the TomTom has the built in HRM it will not be enabled in Swim Mode and during open water swimming, it doesn’t measure distance or heart rate. To be honest it doesn’t actually have a open water swim setting. So if you want you can set the watch to ‘run’ mode. 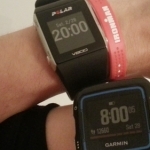 It will not track your swolf and such, but should track your distance, pace and heart rate. 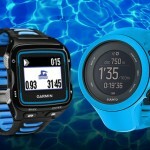 So the Garmin takes the cake, with full support for pools, technique, SWOLF, drills and open water. But if you train 95% in a pool the TomTom is a very good option. Another true difference is the support for power meters. The TomTom does not support any. But again, if you are not a competitive age group athlete you probably don’t really care about this. Both the Garmin and TomTom can be mounted on your bike, the Garmin can be mounted with a quick-release. This allows you to take it off very quickly too and put it back on your wrist. Ideal for a race and if you prefer to have your data in your face instead of on your arm this is a very good accessory. The TomTom comes with a little mount too and is easily mounted on your steer. Note than you’ll lose heart rate measuring then if you don’t add a bluetooth chest strap. The TomTom is rather good at the running metrics, the added value is that you don’t need to put on a chest strap, which some people find annoying or forget. But we’ve also read that the TomTom might be a bit uncomfortable on the wrist, I didn’t have this feeling on runs under one hour. having small wrists it does get a bit itchy wearing it for long periods of time, but hardly noticable during a workout. What I really like is if you want to quickly go for a run and you don’t have to bring that extra HRM thingy along. Looking at it technically the Garmin is superior, as it can give you your running cadence, ground contact time and oscillation. But also has a built in Metronome and a VO2 Max test, whereas the TomTom falls a bit behind with just speed, pace and heart rate, which again, is sufficient if you’re not a professional but leaves a bit of a gap with the 920XT. The TomTom has a rather limited battery life, with a 10 hour estimate on just GPS and a mere 8 for GPS and HR, which for a full distance triathlon is simply not enough (and for some a half). It also has no actual Multi-Sport mode, so when you do a triathlon, you’ll have to manually start and stop every part of it, and thus can’t measure your transition times. 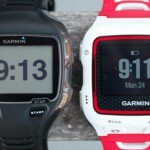 It falls behind compared to the Garmin’s excellent multisport mode. The TomTom is really quick on picking up GPS so for a quick run there is no hassle of waiting for that signal, and the lack of a chest strap also is an added bonus, specifically when traveling. The Garmin 920XT is truly a step ahead of the TomTom MultiSport Cardio on just about every feature, but that’s not surprising looking at the price difference: the 920XT is roughly $200 more expensive!. Also taking in to account the history of both companies, Garmin has quite some experience with previous models and feedback from the 910XT whereas TomTom is quite a new player. If you are really serious about triathlons and want to do half or full distance, the Garmin 920XT (or 910XT) is your weapon of choice. If you’re more interested in just seeing how you perform, like to go for a quick jog, casual ride, or swim and race without a watch, don’t fork up the big bucks and get the TomTom. It’s a good value for money. The TomTom Multisport and Garmin 920XT on my wrist. 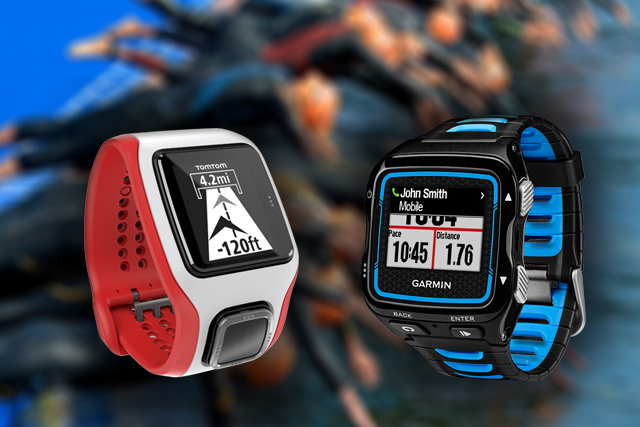 These are localised prices and if you look at the features it may come as no surprise that the TomTom is a lot cheaper than the Garmin 920XT. The MultiSport watch itself is available for $314 on Chain Reaction Cycles. 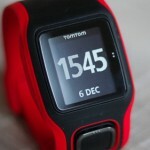 If you want more information please read my in depth review of the TomTom MultiSport Cardio. Not sure comparing devices in totally different price ranges. Like comparing a Golf gti and a Ferrari. TomTom Multi-Sports support TomTom bicycle cadence and speed sensors.You can buy the kit as an option or get one included with specific versions of the Multisport. The Kit includes a dual sensor for the bicycle left side chain stay. It also includes two magnetic pickups–one to be attached to a spoke on the rear wheel and one that attaches to the left crank arm. The kit comes with all parts to attach well, looks very nice and works great.